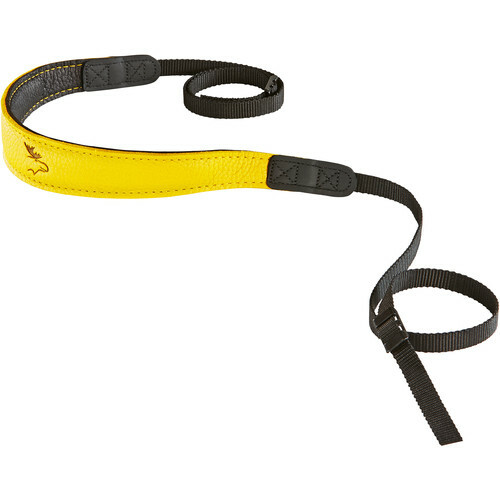 Carry your camera in style and comfort with this yellow/black-colored Fashion -1- Strap with yellow stitching from EDDYCAM. Made from Scandinavian elk leather and featuring built-in natural rubber padding, users will enjoy a great feel all day. This small model has a load capacity of 0.6-1.8 lb and measures 1.3" wide and 55.1" long for working with many different body types. Also, it features a wax coating for protection from the elements and general wear and tear. Additionally, it comes with black stainless steel clips for adjusting the length of your strap. EDDYCAM sources wild Scandinavian elk leather from a tannery in Finland and then produces handmade straps in a workshop in Bavaria, Germany. Are the quoted load capacities based on comfort recommendations or acutal strap integrity limits? I dont know the weight capacity but it seems plenty strong and very comfortable. Excellent quality.